The team at Yo-Zuri has once again come up with a “must-have” lure for any serious saltwater fisherman. The Sashimi Bull Metallic combines presentation, casting distance, and toughness in a single lure. It is available in two sizes and 11 different colors and features an amazing finish and great casting distance. 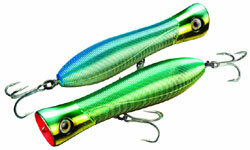 “The 8 inch version of this lure is my FIRST choice when targeting big yellowfin tuna. I always travel with several lures in a variety of colors. Honestly, I really don’t focus very much on selecting the best color, they all seem to work well when it comes to yellowfin. Achieving maximum casting distance is critical and at nearly 5 ounces this lure is perfect for the heaviest spinning tackle.